Also, she started following Ennio Morricone. Chris posted a new story, yesterday/today, but it's no longer there (or at least nothing happened when I clicked on his profile circle via PC). It said he'd written something for 2 different artists. Carla Colour was one profile name, and something else I can't quite remember. For what it's worth, which isn't much, I'd prefer it if Hayley didn't follow the current trend and have a tattoo. She has always maintained a great deal of dignity and propriety, even in the difficult times. "Tats" would, I believe, detract from this. The above caveated, as always, by the fact that it's entirely up to Hayley. I never thought of Hayley as a tattoo person, either, and I’m not keen on them for myself. But, I don’t have any problem with other people getting them if that’s what they want. 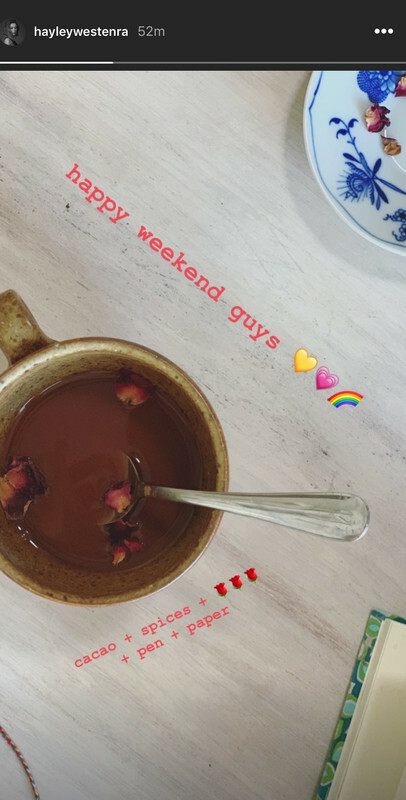 Hayley posted a story a few hours ago, and so did Chris. 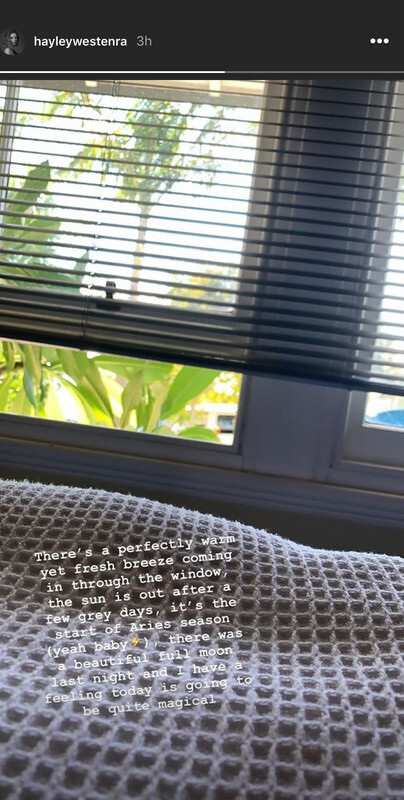 Hayley’s is a photo of her window above her bed (wherever she happens to be right now), with possibly her most wordy note, aside from the recent message about the Chch tragedy. She mostly talks about weather and Aries (her astrological sign), and that today is going to be magical. I hope Hayley also has a magical Thursday too! It will be my birthday! I would say for "Chris Gaelan" (alongside your great description, Libby) is that he is at an older-looking sound mixing table/board/console. There is a label of a ram (perhaps the logo of the manufacturer-- I could not find any pics. There is a brand of Aries sound boards). The fold label color kinda matches the color of the button descriptions. And right next to that, the tape counter is showing a triple three-digit number, that I also will not display here. Hayley posted this from Auckland, NZ about an hour ago!! Are things getting exciting, or what?? Well spotted Libby, you are razor sharp on the smallest details, well done. That's one big sound desk (or mixing desk.). Back in my college days, I used to do some ad-hoc lighting and PA for live performances with a dear friend, mostly on the Edinburgh Festival Fringe. Being short-handed and on a budget, we'd have to handle both the sound and the lighting desks during a performance. That was well over 30 years ago (nearer 40 actually, but don't tell anyone), and I don't think I could move quick enough to handle both at once these days! I've never used one anywhere near as big or as sophisticated as the one in the pics. It's a professional quality studio desk and as far as I can see has 30 channels. For the non-cognoscenti (hope I'm not teaching Grandma the gentle art of egg-sucking), each channel is controlled and monitored by one vertical row of knobs, buttons, faders and level meters. Because the level meters at the top are wider than each button stack, they're arranged vertically in pairs. Each channel takes one audio input. That is, the input from one microphone or one instrument such as an electric guitar or electric piano. In my day, it was all analogue, but digital is now popular. The one in the pic has a nice period feel to it (the wood) so I suspect it's analogue. This sort of kit is not cheap. I've just found a much simpler 24 channel analogue desk on the web for £85,000. Therefore not really something for your back bedroom. For one voice and a handful of backing band instrumentalists' area mics, it's serious overkill. But I suppose if you hire the studio, the desk is part of the package. Hayley seems to like a fair bit of reverb on her recordings, so maybe this desk can provide this along with the warmer and fuller tones alleged to be provided by analogue format compared with digital. Whether a post-mix conversion to digital media format (MP3) effects warmth and fullness of the tone I don't know. I'm pretty sure it's the same desk in both Hayley's and Chris' posts, so I think we may safely assume that he is missing his car once again. However spending time with Hayley is probably some consolation! Black speaker support boxes on top of the desk, polished wooden floors, slatted things, red soft furnishings (carpets/seat tops) and squashy cushions all point to the same place. That rams head logo (is it a rams head?) is interesting and why are we nervous of the "number of the beast"? 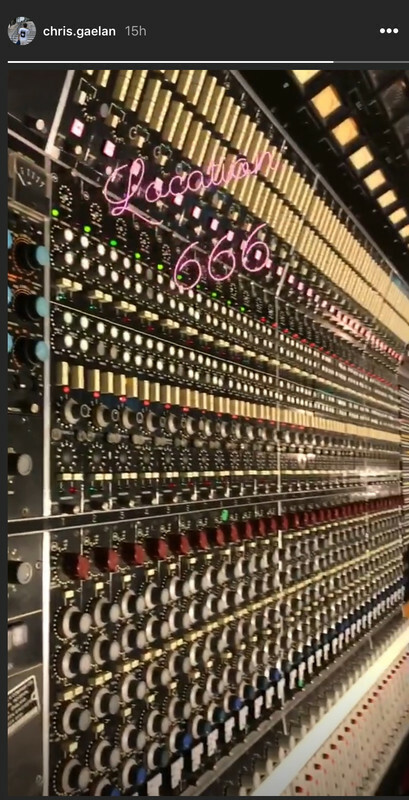 I recon the "66 6" on the display is just coincidence, but why "Location 666"? Presumably an in-joke at the studio. I also recon Libby's right and that it is the same Auckland studio that we saw in January. I see that some cynic has responded to a poster on Hayley's b&w mic pic who hopes that a new recording is in the offing by noting that "she only writes and travels the world nowadays". It's unfortunate, but I'm inclined to agree. So come on Hayley, extract digit! I know it's your art and it's got to be write (Freudian slip – I meant "right"), but I've only got a couple more decades of wasting food and oxygen left. Mischievous thought – bet she reads this BB. I would! 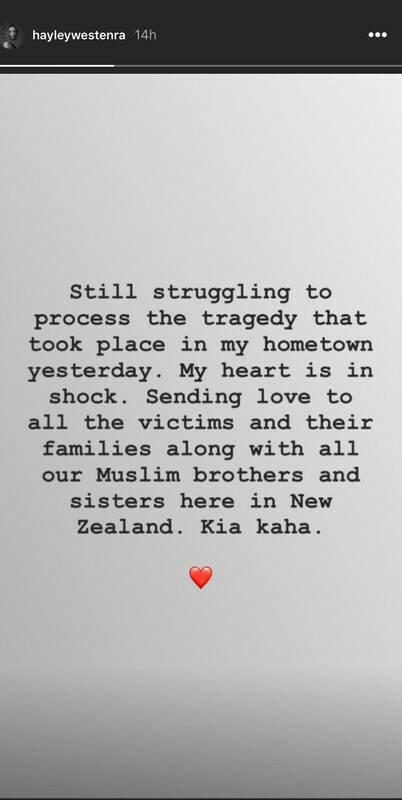 Chris posted a video and a story. The video is of him playing a tune on what he calls “the hammond”. Is this one of Hayley’s songs? Then his story is actually in 3 parts, with an organ making sounds. Hammond is the brand of organ that Chris is playing. It's a very common sound (although less so nowadays). The spices could be nutmeg and cinnamon! That sounds really good on this snowy and windy Friday night!